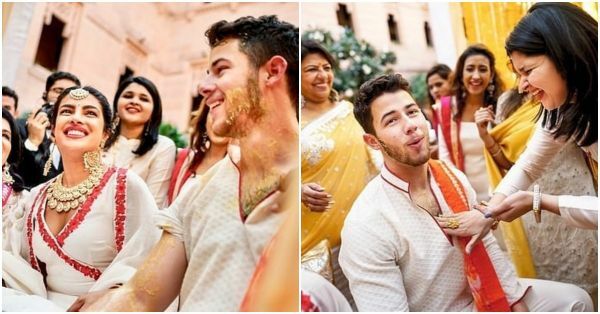 Nick & Priyanka Just Can't Stop Smiling In These New Pictures From Their Haldi Ceremony! Priyanka chose a white anarkali for her haldi and Nick twinned with her in a white kurta. In one of the pictures, a delighted PeeCee, is seen encouraging her mom and other relatives to smear the videshi dulha with haldi. In another picture, Priyanka looks totally at peace with herself as one of her relatives tie the custom made chooda to her wrists. We love the bandhani dupatta that the desi girl paired with her white anarkali. The haldi was preceded by a mehendi ceremony for which Priyanka chose a flamboyant Abu Jani Sandeep Khosla anarkali. Priyanka, all-smiles, flaunts her henna laden hands in the new pictures. Another candid shot gives a glimpse of an ecstatic Nick shaking a leg with Priyanka’s brother Siddharth Chopra while cousin Parineeti and the bride look elated in the background. The couple sent their fans into a frenzy when they announced their roka on social media. They tied the knot in two ceremonies- a Christian and a Hindu- in December last year. A few days ago, Ralph Lauren shared the making of Priyanka’s gorgeous wedding gown that had over 11,000 Swarovski crystals and a 75-foot long veil. The wedding venue was the stunning Umaid Bhawan in Jodhpur. Following the elaborate wedding ceremony, the couple hosted a grand reception in Mumbai for the tinsel town. Prime Minister Narendra Modi also graced the occasion. After honeymooning in the Caribbean, the couple has now settled in their new home in Los Angeles. They will be travelling to India in February to attend the maiden concert of Jaden Smith, who is a close friend of Nick. Priyanka is currently working for her upcoming film “The Sky Is Pink” directed by Shonali Bose.